KUALA LUMPUR (Nov 28): Matang Bhd, enroute to a listing on Bursa Malaysia's ACE market, has appointed M&A Securities Sdn Bhd as the underwriter of its initial public offering (IPO). Matang said M&A Securities will underwrite the entire 130 million new shares to be offered to the public via balloting. The IPO will involve the issuance of 130 million new shares of 10 sen each, representing 7.18% of the enlarged issued and paid-up share capital of Matang after listing. 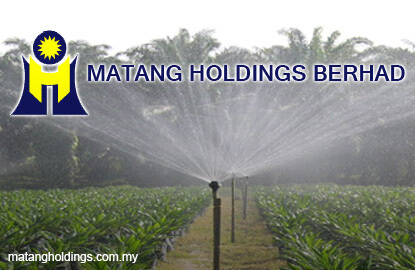 Matang chairman Datuk Teh Kean Ming said the M&A Securities' appointment as adviser, sponsor and underwriter would bring Matang a step forward in the IPO exercise. He said the listing would provide the company financial flexibility to implement its strategy to carry out replanting exercise for long-term sustainability and growth. Proceeds from the IPO will be used primarily for general working capital requirements including day-to-day operations and for the purchase of fertilisers. Proceeds will also go towards replanting exercise to improve the overall age profile of the oil palm trees in Matang Estate and capital expenditure to enhance the effectiveness in estate operation. Teh said the upward trend of crude palm oil price from a low of US$480 (about RM2,136) per tonne in September last year might offer a good chance for top-line growth for the company. He added that crude palm oil is currently traded at over US$650 per tonne.